Send a Little Love with a Back to School Gift Basket! Take advantage of Skype or a similar service. As wonderful as it is to talk to one another on the telephone, being able to see someone’s smile is priceless! A good phone call can warm the heart, but when you can actually see your loved one talking, reacting, and just being themselves, they suddenly don’t seem so far. Text pictures of your day. You don’t have to send one another a steady stream of photos cataloging every place you go, but try to send one at least every few days. It could be as simple as a picture of a café with the message, “Wish you were here to have a latte with!” You never know when that’s exactly what the other person needed to cheer up or be reminded that you’re on their mind, too. Send a card. For as amazing as the internet is in helping us stay in touch with each other, a personal, hand-written card is still a wonderful thing to give and receive. Set aside some time to really dedicate your attention to the card – you might be surprised by all the things you think to say when you aren’t distracted! Send a Back to School Gift Basket. You had to know we’d get here eventually – we love gift baskets! But the thing is, most people do. We aren’t alone in our love! And sending a gift basket to your family member or friend will provide them with a little pampering and a reminder of how much you care. Want to send something they can share with their roommates? 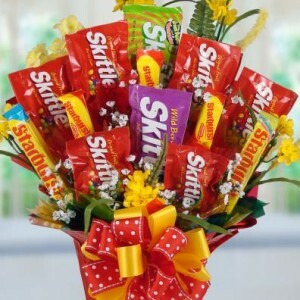 Consider one of our candy bouquets or cookie bouquets. Whether or not they actually share is up to them, but it’s at least an option!